It's part of a strategy to halt global warming by cutting down the amount of CO2 we vent into the air and then re-using it—a technique known as carbon capture and utilisation (CCU). 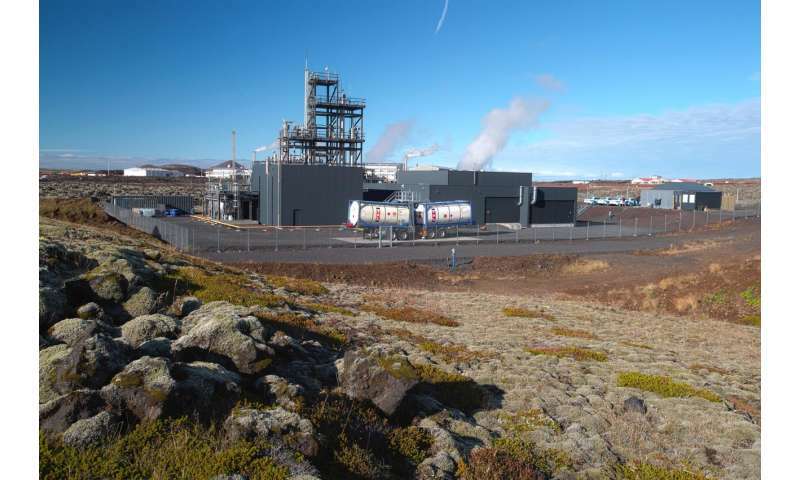 "We take CO2 originally dissolved in the steam coming from underground and we re-use some of it as a raw material in our process," said Ómar Freyr Sigurbjörnsson, former research director and now head of sales and marketing at CRI. CRI built their demo plant in 2012 and became the world's first company to produce and sell methanol made from waste CO2. Since 2014, the plant can manufacture around 4,000 tonnes of methanol per year, which is sold in other European countries. CRI's process is far more sustainable than regular methanol production. In Europe and the US, most methanol is made using natural gas, whereas in China coal is used. "We are able to sell in the same fuel markets in Europe as other fossil fuel methanol, but we get a premium price," said Sigurbjörnsson. Methanol can also be stored and transported from renewable energy production sites to where consumers are. "We can convert renewable energy into chemical energy that can be stored for a long time, and it can be moved long distances without losing energy. It has these advantages over say battery technology," said Sigurbjörnsson. "We plan to have more partners co-invest with us, such as power companies, chemical companies and different industries," Sigurbjörnsson said. "Our focus is on developing the technology and licensing and selling the equipment that goes with it." This can lower emissions but won't swallow all of industry's CO2. "Since the industrial sector emits 40% of all carbon dioxide, we are trying to capture it from the chimney and do something useful with it," said Professor Patricia Luis Alconero at UC Louvain in Belgium, who has just begun an ambitious project to turn waste CO2 into useful chemicals. Her project, CO2Life, is inspired by nature. "Our process looks at the way nature takes up CO2 for its own ends. We try to copy nature's use of enzymes, but in a way that is more efficient and which uses membrane technology," she said. "This process is flexible since depending on the enzymes we use, we can get different chemicals," she said. Examples include carbonate salts, such as sodium or calcium carbonate, a raw material for the cement industry, or glucose. "CO2 is a waste, so it really has to be a cheap process that leads to an interesting component," said Prof. Luis Alconero, who aims to build a prototype system. "Our objective is to come up with a solution that is more environmentally friendly than amines and also to solve the economic issues," she said.